Ain't it always the way - a boy and a girl, and another boy and a girl are having fun in the wood when a deranged witch snatches the girls and turns the boys into bubble dragons! Bit of a kick in the pants for the boys, but hey now they are wicked cool dragons and have the awesome might of...well...bubbles to help them rescue their beloved lady friends. So can they drag their scaled, washing-up-liquid-drinking, hides through cave after cave of monsters, wind up robots and rock throwers in a bid to get back the loves of their tiny lives? Or will they be slapped daft by the subterranean denizens and send screaming to the password screen? Only you can decide! 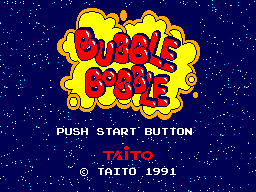 It's a classic and if you haven't already encountered Bubblen and Bobblen (Bub & Bob for short) in this particular game then you're sure to have seen them in one of their many cameos in other Taito titles. The aim of the game is to jump around self contained environments that the booklet calls caves but for most part look like multicoloured acid trips and bear little resemblance to their real world rocky counterparts. 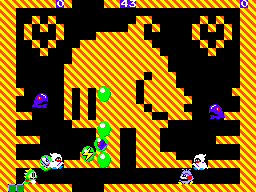 While legging it around said environs you will have to dodge and blast enemies with your bubble power and then burst the bubbles they are contained in to get to the juicy goodies inside and move onto the next cave. The more bubbles you manage to burst in a chain the higher your points will be and the better the delectables that burst forth. In addition to your own bubbles there are various other bubbles that float around certain levels that contain water, and thunder, and other doom bringing elements, and if you burst these nearby enemies will be washed away in a flurry of seething torment! Joy! 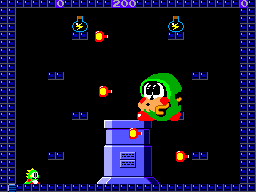 There are tons of secret bonuses to be had and not only can you encapsulate the enemies in bubbles and burst them but you can also ride your bubbles for a time to either get out of dodge or get to some glimmering prize that may be out of your reach. Oh, also, one other thing I forgot to mention is that if you are close enough to an enemy when you blow a bubble you will bite them, but this is a risky business and not usually worth the pay off as you'll want to be going for those all important combos. When you've cleared a certain amount of levels you'll get a password and also you'll have to face a boss or two. Most of these bosses are large, king-like versions of their tiny brethren that infest the massive amount of levels that are on offer. All in all it's a challenging ride but one so addictive and fun you'll be glad you bought the ticket. In addition to all this two player only adds to the fun and longevity of the whole glorious, retro-classic, package. Bright, colourful, functional and nearly a spot-on little clone of it's big arcade brother. A lot of people claim that not only game play wise but graphically this is one of the closest conversions of the original and I would have to agree. A mighty fine job has been done all round and it all moves at a slick pace. Great job! The sounds effects are bleepy boppy affairs, but the music goes a little like this - Step One 'Ooh this is nice and cheery' - Step Two - 'Dear God, I'm humming that tune in my sleep!' - Step Three - 'Sweet vampiric zebra's that music is annoying as hell, I never it again as long as I live.' Soon enough I was listening to the Misfits on my MP3 player and getting along with the game just fine again, ah sweet technology. Tight as a manager's wallet and smooth as a creamy vanilla slice. Near as perfect as perfection can get! It's immense (and I do mean immense); there are so many levels it'll destroy your thumbs before it's through and you've seen all it's endings - then their's two player - then theirs score beating and then you'll probably pick it up for a blast every now and again just because it's so damn playable. Well worth your time, pennies and thumb muscle power! It's a classic for a reason, and it ain't one of those 'cult' classics where only freaks think it's great when in reality it's a steaming pile of bum-nuts, this is the real thing and with a near perfect conversion and tight controls beyond belief this is one to grab, hold onto, and never let go of. A shining diamond in the pantheon of SMS games. So there.